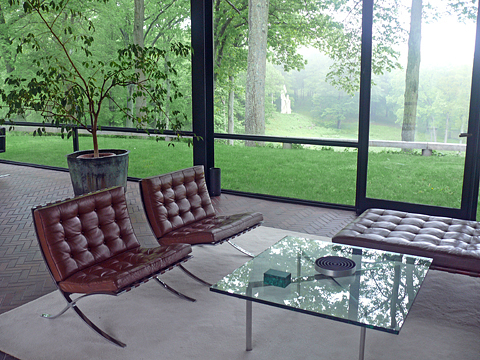 If we could count the number of times we’ve admired pictures of Philip Johnson’s Glass House over the past several decades the total would be well into the hundreds. When it opened for tours a few years ago we very much wanted to see the real thing however a flood of public interest meant that tickets for the May to November season sold out almost as soon as they were made available. Luckily this year was different and we were able to purchase tickets for a 3:30 tour on a Monday near the end of May. 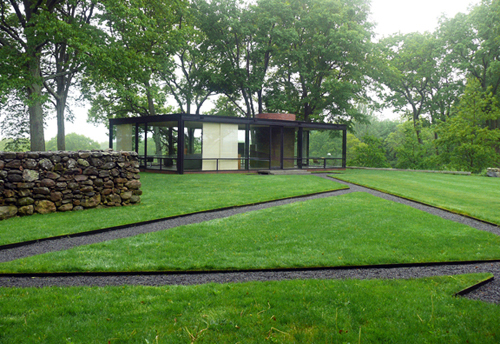 Your visit must start at the Glass House visitor center located directly across the street from the New Canaan train station. If you arrive by car, parking can be found in a nearby municipal lot. The basic tour takes about an hour and a half at the cost of $30 per person and operates in all weather conditions. The day of our visit it was raining on and off so umbrellas were generously provided. A comfortable shuttle bus transported the small group for the 8-minute trip and dropped us off inside the front gate. 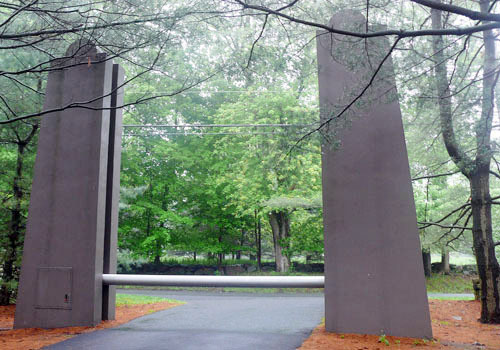 Johnson closed his drive from road traffic with a gate that consisted of an aluminum ship’s boom suspended horizontally between two tall masonry pillars. The engineering necessary to raise and lower the boom reportedly was quite difficult to solve. Our group murmured with approval but, apart from the function, we did not think the visual aspects worked as well. 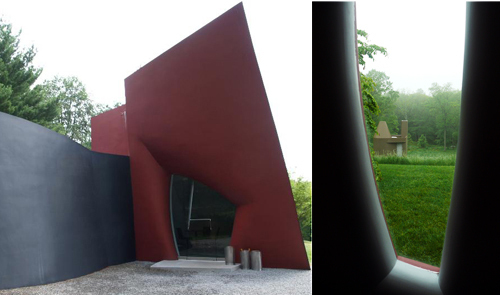 On one side of the drive is a small red and black Postmodern style building, composed of unusual angles and curves, reminiscent of the work of Frank Gehry. On the opposite side, a bit further off, sits a nineteenth century clapboard farmhouse. The property is populated with numerous buildings of radically different styles and functions. Do not arrive expecting to see a site dedicated to Modernism, instead realize that Johnson, with family money and substantial shares in Alcoa, had the wherewithal to indulge in diverse architectural experiments and follies. 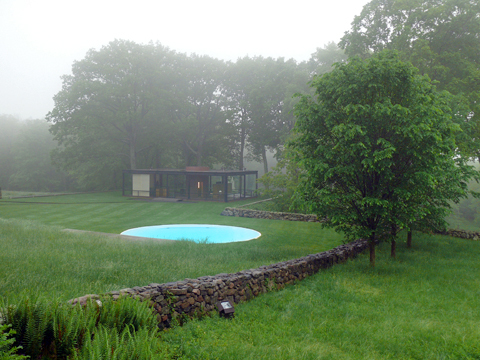 The Glass House, not visible from the gate, appears after a short walk down a gently sloping drive and past some strategically trimmed evergreen trees. 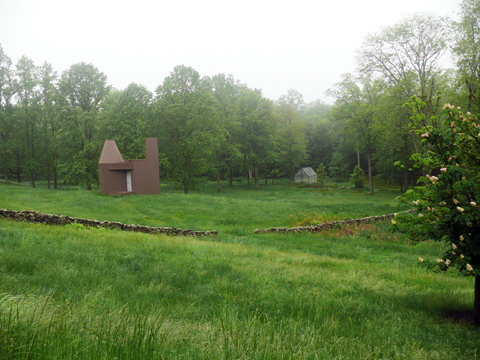 On first sighting the house is fronted by a large circular sculpture by Donald Judd, a dry laid stone wall, a red brick guest house, and small grassy lawn crisscrossed by neat gravel paths. 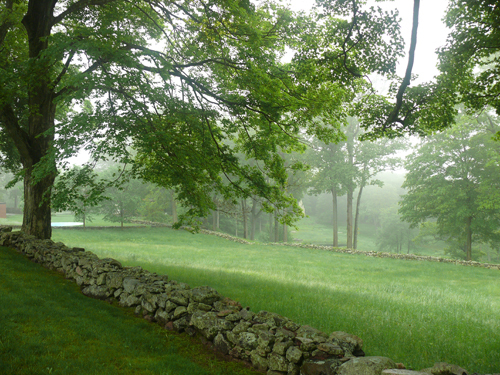 The effect is atmospheric and contemplative, perhaps more so due to the misty weather conditions of that day. Our guide wisely let us wander about the house for a few minutes before she made her presentation, knowing that we would look and not listen at first encounter with the architectural icon. Some of our random observations; stark yet comfortable, quietly masculine, leather covered tables and leather tiles on the bathroom ceiling. The touches of white in the plush rug, bed cover, window shades and statue of two voluptuous women saved the place from serious brown overload. Kitchen cabinets were delaminating in spots and seemed inadequate for realistic cooking. It was explained that cooking was pretty low on the list of functions in this space and other buildings on the property would be used for dinner parties, etc. 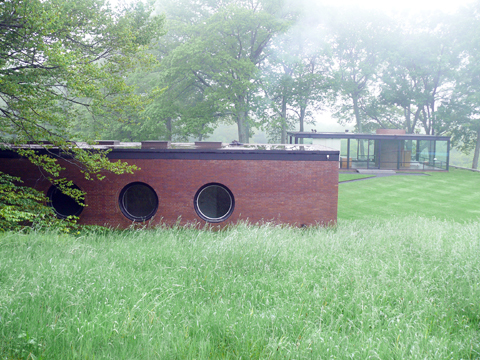 Johnson likened a stay in the Glass House to a camping trip; a place to interact intimately with nature. There is neither air-conditioning nor are there screens on the four doors that open on each side of the house. In warm weather bugs are invited to cohabitate in the space, seemingly at odds with the mathematical, machine aesthetic of the Modern Movement. The mechanics are invisible. The sub floor heat, piped underground from the nearby brick guesthouse, was probably inadequate for a structure that is separated from the elements with a single pane glass walls. The view from inside is fantastic. 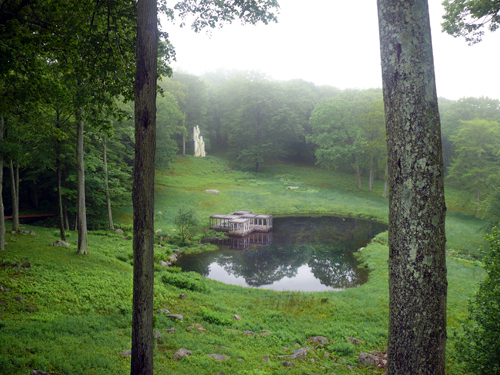 Tall trees trunks frame a pond with a pavilion and a large sculpture on the hill beyond. 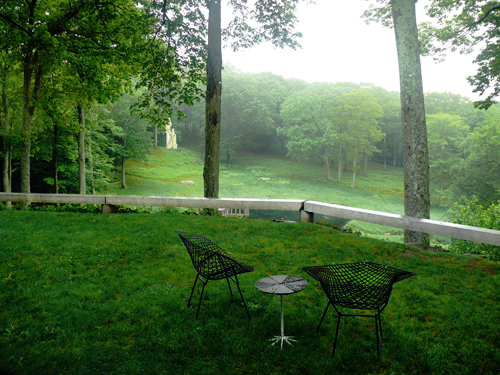 All of the grounds are beautiful, especially the open unmown fields. Our small and practical mind had pedestrian questions, such as how often the windows were washed. We were informed that it was once a week, alternating inside and outside. Upon exiting the Glass House we were told that the brick guesthouse was closed due to discovery of toxic black mold. Our tour then moved up a path to a spot that allowed a direct frontal view of the house. This vantage point brought the round swimming pool, intensely bright turquoise, into prominence. We wonder if changing the surface to a gray or slightly more natural color would be an improvement. 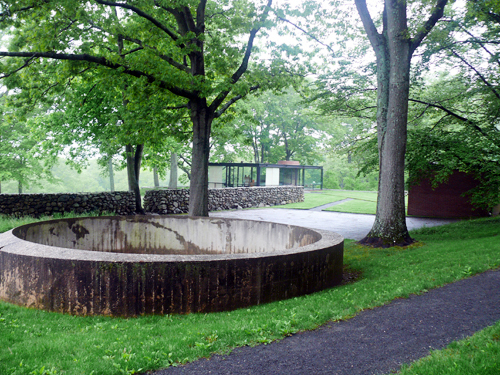 Further down the path sits the entrance to the underground bunker that functioned as Johnson’s painting gallery. 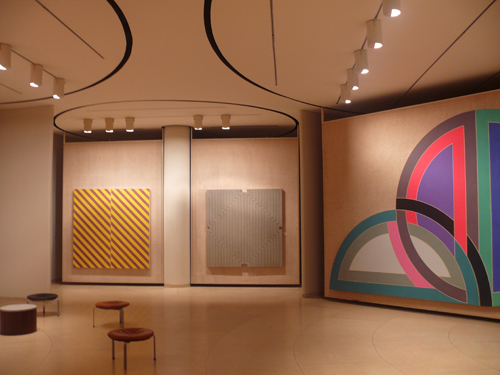 The windowless (and freezing cold) space was filled with his collection of over-scale Modern paintings. Only a few were visible, others were hidden on panels that rotated 360 degrees. 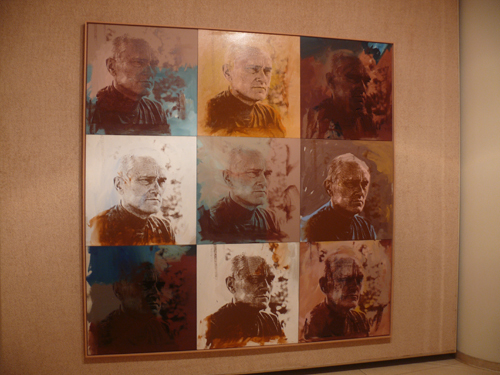 We did catch a glimpse of a handsome Warhol portrait of Johnson, the only likeness of the owner that we saw on the property. 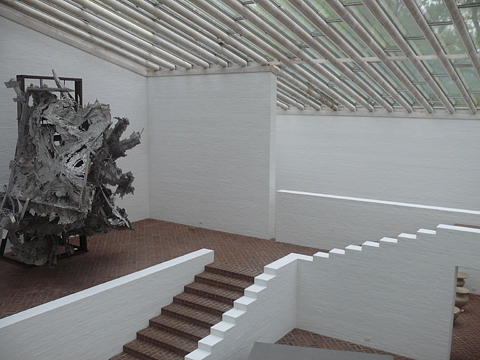 Outside, we moved onto a sculpture gallery roofed with metal trusses and glass panes that allowed natural light to flow down onto the art collection. Unfortunately the rain also flowed in, rusting the beams and gathering in small puddles on the floor. It’s only possible to peer over a railing to see art on the lower levels and ceramics in a distant gallery. On our return to the gate the guide discussed Johnson’s separate office building, or office hut. The whimsical combination of geometric shapes, with a conical top and chocolate-brown exterior, looks like a child’s playhouse. 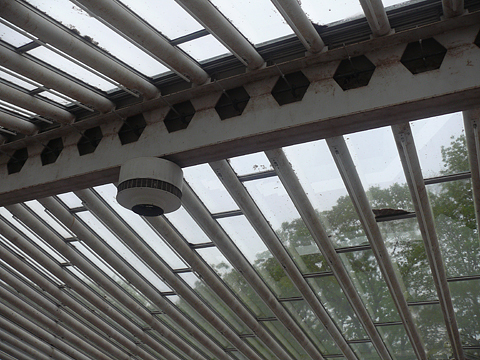 Below the office is a ghost-structure of a greenhouse that was used for growing peonies by Johnson’s life partner, David Whitney. What we did not see was Johnson’s dramatic nighttime lighting of the house. Thanks to the work of the local high school students, it has been recorded and posted on-line. We took the van back to the visitor center and gift shop where we chatted a bit more with our guide. The entire staff was terrific, friendly and knowledgeable. We believe that Mr.Johnson would have approved of the way his legacy is being preserved and presented. Afterwards we drove north to Hyde Park, New York, where we indulged in a French meal in the Escoffier Restaurant at the Culinary Institute of America. We were seated in front a large glass wall, but this time the view was not Johnson’s arboreal landscape, instead it was of 16 student chefs working hard to prepare our delicious meal. Nice. I have always wanted to go there. Thanks for the great review. Love his un-excused experimental style.